Jamnagar, March 4 (PTI) Prime Minister Narendra Modi Monday hit out the opposition for questioning his statement that the presence of Rafale fighters would have given greater firepower to the IAF during the February 27 aerial engagement with Pakistan. Modi also flagged off the Bandra-Jamnagar Humsafar Express and launched development projects, including the 51-km pipeline from Aaji-3 to Khijadia. He said structural and long-term measures are required to overcome the challenges faced by the country, instead of poorly thought out short term ones. Hospitals that have come up in the past few years in Gujarat will greatly benefit the poor, he said. The Ayushman Bharat scheme rolled out by the Union Government will ensure affordable and quality healthcare for the poor, he added. Modi lauded water conservation measures adopted by the Gujarat government. The government has big plans to provide water to people by establishing big desalination plants, he said. Slamming the Congress, Modi said the party’s programme was to announce farm loan wavier every ten years and collect votes by fooling people. “Our government will give direct financial assistance to farmers every year. 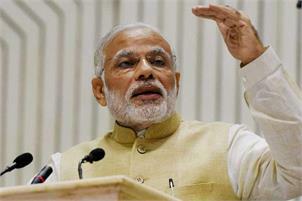 When Rs 75,000 crore will go to rural economy every year it will have a positive impact,” Modi said.